Have your smoke detectors been updated according to the latest electrical codes? 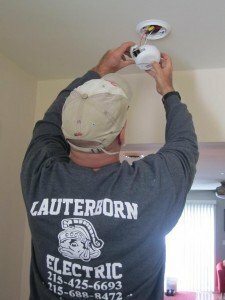 In new residential installations, all smoke detectors must be hard wired, interconnected and have battery backup. They must be installed in all bedrooms, at each hall landing and basements. Carbon monoxide protection is also required within 15 feet of a bedroom and basements. Combination smoke/carbon monoxide detectors are used in locations where both are needed. Many manufacturers recommend replacing your smoke detectors after 10 years. The image above depicts a qualified electrician installing a smoke detector. Do not paint your smoke detectors. Avoid installing smoke detectors near kitchens or combustible areas, such as a mechanical room, to prevent false alarms. Smoke detectors are designed to chirp if the battery backup is low. Many manufacturers recommend replacing your batteries on an annual basis. Smoke detectors have sensitive electronic monitoring components and dusty, dirty, greasy, or insect infested areas can affect the function of the device possibly causing random alarms. Protect your home and family with smoke detectors. 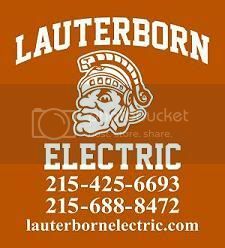 Consult with your licensed electrical contractor, Lauterborn Electric, if you have any questions.